The bathroom is often a room that leaves many of us full of questions and doubts when it comes to its lighting. How do we add the desired style of lighting that’s safe in a bathroom? We know there are regulations and that lights need to be properly rated for use in there, but that also seems to affect our perception of their style. 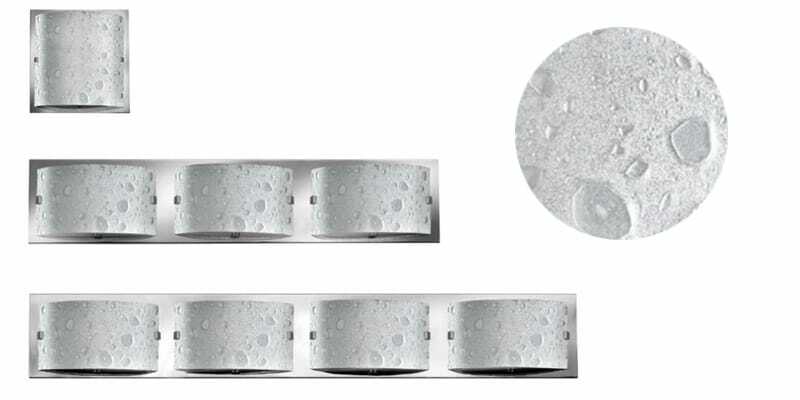 Believe it or not safe, functional and decorative can come together and our new ranges of bathroom lights do just that! The time you spend in the bathroom varies but typically it’s a relatively short stint even when you’re enjoying a soak. It’s often a moment of quiet, an escape for 5 or 10 minutes of pure, uninterrupted peace, so it’s really important that you don’t overlook it! You shouldn’t have to settle for a plain and once white (now yellowing with age) flush ceiling light attempting desperately to adequately light the space. Enjoy the time you get to spend in there by adding a touch of glamour and luxury. We aren’t going to spend time going into the regulations here, instead we’re going to look at the decorative options. In short, however lights need to be IP44 rated or higher for use in a bathroom, for more information on this see our other blog here: Bathroom Enlightenment. The variety of decorative lighting available for a bathroom is likely far wider than you think. From something more flamboyant such as the Plantation (shown above left) to sleek and stylish such as the Mona (shown above right). There are decorative ranges to suit any bathroom, from period, traditional designs to contemporary and modern styles. 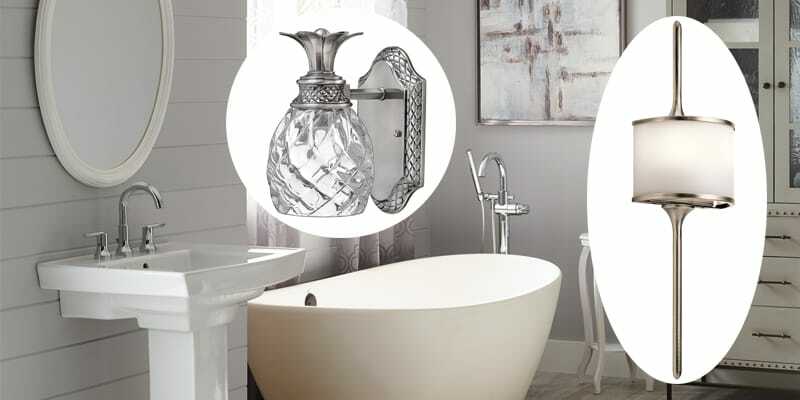 The Payne lighting range (below left) has a traditional influence with an ornate polished chrome metalwork and opal glass diffusers that would well suit any Art Deco, Edwardian, Georgian or Victorian style bathroom. Lights such as the Falmouth (below right) bring a modern vibe with their curved polished metalwork and fabric shade which is sure to bring in that “living space” feel into a room that is notorious for feeling void of it. 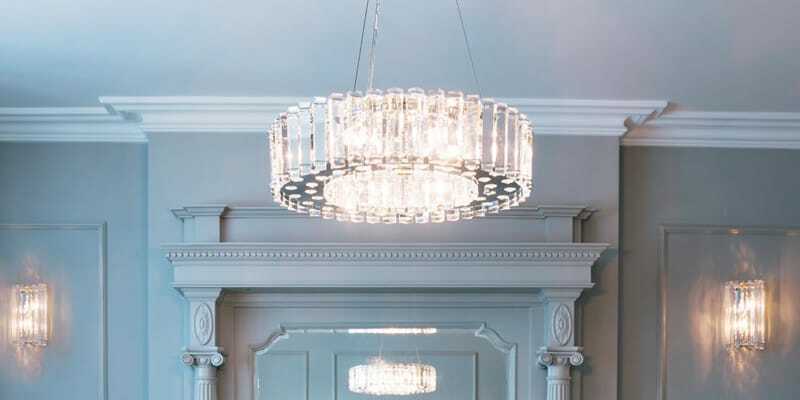 I’m sure we’ve all yearned to add sparkle and glamour to the bathroom with a statement piece and I’m sure we’ve always considered a chandelier, only to find regulations are yet again, dictating our design choices. Well – no longer! Our new range of lighting sees additions to our bathroom chandeliers so it’s easy to add the glitz you’ve craved. We’re advocates of crystal in bathrooms – their shine and clarity add to the overall sense of cleanliness in the room whilst bringing a glamorous effect. Bathe and relax in luxury with the newly IP44 rated Crystal Skye range (shown below). 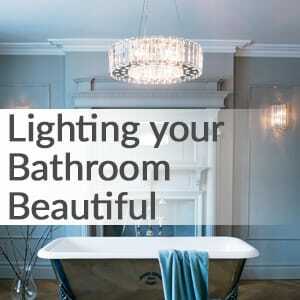 So why not treat your bathroom to a new range of beautiful lights, to help accentuate your design and make your five minutes of peace a decadent haven to revitalise. It may interest you to know we have a full FREE digital magazine full of inspirational content and offers. Sign up to our newsletter below to become one of our enlightened VIP’s and receive your FREE copies now!